This question comes up surprisingly often – people get confused with how to read the visa bulletin. Once you know, it seems very obvious, but let’s just run through it. Each month (around the early to middle of the month) the visa bulletin is released. The bulletin covers more than just the DV lottery information, but the numbers we care about are in there. The link for the main visa bulletin index is here. 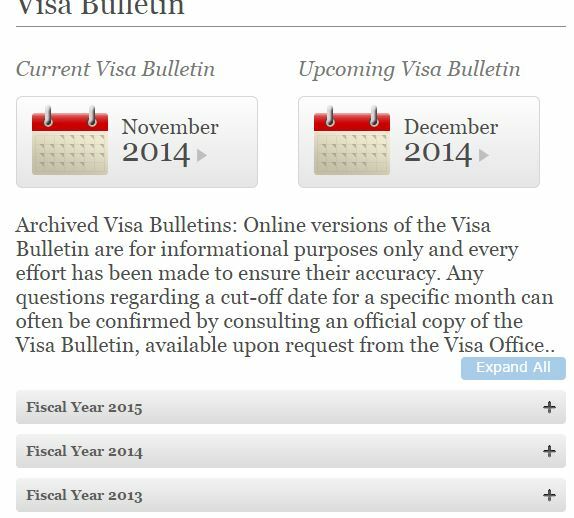 You will see a page as shown below – the current and the upcoming visa bulletin. The upcoming VB is the one we are interested in. It provides information on what cases will be interviewed in the upcoming months. For example, as I write this it is late November. 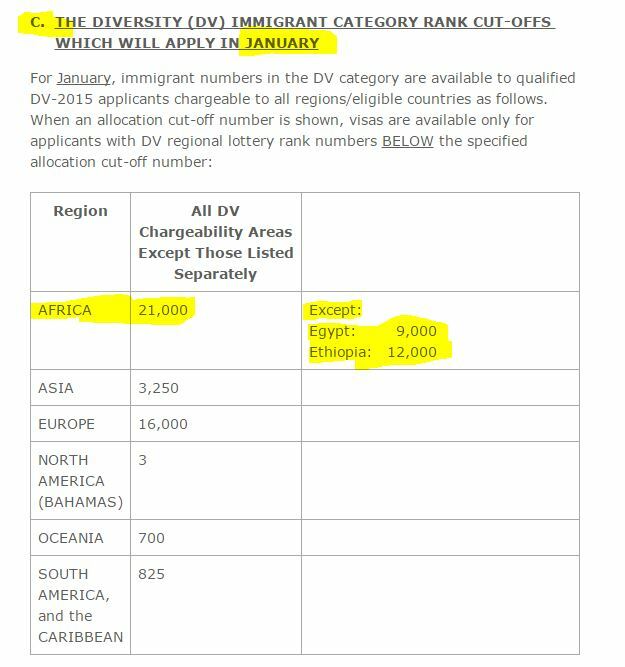 The VB that was released a couple of weeks ago is the December visa bulletin and it gives numbers on January interviews. So – click the Upcoming visa bulletin link. In the VB itself there is some information on other types of immigration. However, if you scroll down the page you will see there are two sections of numbers regarding the DV lottery. We want to look at the second set of numbers, lower down the page as I am showing below. You can see I highlighted the fact that the second section (section C) covers the following month (6/7 weeks after the release of the VB). If you look at the section where I have highlighted Africa you can see there are numbers by each region. Africa shows 21000. That means that if your case number is 2015AF20999 of lower you are eligible to be interviewed in January (assuming your DS260 has completed processing when KCC need to schedule the interviews). The number will increase a little each month so every month a few more cases “become current”. So let us assume that a month later this number says 27000. In that case any African case number under 27000 (i.e. 26999 and below) is now current and may be scheduled for interview. It does NOT mean the 21000 and the 27000 are somehow added together. It also does not mean that numbers under 21000 have missed their chance. It simply means your CN must be less than the number shown for your region. You can see I also highlighted two countries (Egypt and Ethiopia). This means that selectees chargeable to those two countries (regardless of where they will interview) are subject to a lower limit. This is done to slow down processing for countries with a high number of selectees to spread out the workload over a longer time. Typically these countries have been limited during the draw as I explain in my post about the draw process. In previous years we have seen various regions going “CURRENT”. This means that KCC have calculated remaining likely demand and believe they have enough visas remaining to satisfy all remaining demand. Between 2009 and 2013, that was “normal”. However, the over selection of winners in DV2014 meant that the big 5 regions did not go current, and I expect the same thing to happen in DV2015. That means the final VB of the year (the August VB, released in July) will have a region cutoff that is lower than the highest case numbers and that will mean that some selectees will never be invited for interview. That was the case for many thousands of people in DV2014, in all regions. You can check previous years VB numbers for the 5 main regions in this post about historical VB data. hello sir my CN s 2017AF00024### nd i submitted my DS260 yesterday when do u think will be my interview date. 1. When do you think I will approximately receive my 2NL? 2. What link can I follow to know my exact date of interview If I don’t receive my 2NL? I heard that interviews start on October so how come you are assuming that his/her interview will be scheduled in August? 2NL is the interview notification, not the interview. Inform the CO of the change in the interview. pls sir kindly help me explain the meaning of current.my number is AFooo480xx but on the july bullitin im seing current.do i still hv chances 4 interview? pls sir my number is 480xx.do i still hv chances 4 interview? Thanks a lot for your wonderful informative page. My wife and I entered as married, submitted DS 260 jn June 2016 with CN 2017AF43XX. 2. what preparations would you suggest. Please check the articles I have already written…. Hi sir I am the winner 2017 dv lottery my case number is 2017AS000035## when will be my interview.thanks. Sir 2016Af53xxx is current for interview for september. August – and if not ready, then probably September as well. Sir my wife n I were schedule for August 25 2016 Interview and she is d principal Applicant and she just took the the waec examination recently. Please give us idea what to do bcoz is ready worry us. She must meet the education requirement at the time of interview. Sir u can do ur medical at any hopital or a special hopital. It has to be a physician trusted by the embassy – each embassy publishes their list of trusted physicians. 10x sir but i don’t still understand it, I want to still no that what u saying is that the embassy can deside where u talking d medical test. The embassy publish a list of doctors where you can take the medical test. You book the medical with one of those doctors. Sir futher more u can carry ur medical pepper n police clearence during ur interview day as part of the document too.10x God bless u. Sir your posts are really credible and helping us a lot. I am confused with some basic questions. 2. Does the poor result ( around 50% to 60%) of higher education affect the 2NLs to come? 2. The 2NL will come anyway. You were not asked or expected to upload photos with the DS260. Can you please help me to understand where to look for my priority date I’m kinda confused. My priority date is on June 4,2015. I only advise on DV lottery topics. about my interview date. will i be notified via my email ? Thanks for the information. I’m going through AOS processing. Looking at the January visa bulletin- Feb interviews, Asia is at 4700. If my number is 44xx, does that mean I should send in my AOS package in January or February? Thank you. In that case you could send in your package now (as per early filing policy). Would filing early put me at risk for the FO denying my petition? Have there been many cases where the FO denies the petition? Thanks! There is always a chance of incorrect rejection (for early filing or other reasons). They screw up sometimes. Rejections for early filing are rare, and usually those are when someone filed before the year starts (whoch is still allowed, but riskier). The policy memo (link below) should be attached to the I-485 package. You don’t have to use early filing, it’s your choice. So for clarity, I’m from the Bahamas, and currently working in the U.S. under practice training. If using the numbers listed above for chargeability which is 3 for North America, that means that if i am selected may 2017 and my number comes back as a number over 003, The chances of my case getting processed in time is slim to none and would be wasting time and money? Is that correct? No, that is not correct. But first of all – get selected. I think this April bulletin is great news for so many regions with many going Current! Congratulations to all and Thank You, Brit!. If you follow instructions at the link you have in the 1NL, all will be clear. Thank you for maintaining your blog, I’ve found it very helpful in understanding the entire DV process. I have been “selected for further processing.” Woohoo! But I understand that this is far from actually winning. My case number is 2018OC16XX. I have gathered that is quite a high number for the Oceanic region. You’ll be pleased to hear that I’m not going to try and ask you to predict my likelihood of being processed in time. My question is about the VB status going “CURRENT.” You say on this page that it means there are enough visas for all applicants, therefore, I assume it is just a matter of being interviewed in time before the next DV lottery begins. However, on this blog – http://dvlotteryhelp.com/DV-2017-june-Case-numbers.php – they say “current” means the allocation has been exhausted. Am I right in assuming that to try and make my own prediction, if the VB numbers become current, then it’s a matter of predicting how many interviews can be processed in time (ie adding 50-100 per remaining month)? I hope my question isn’t to confusing. The link you posted was created by morons. Ignore it. Current means enough visas. I am seeing OC numbers up to 24XX. We won’t be seeing current. My case no is 2017AF41xxx from Ethiopia. Didnt win in may. Received an email from dontreply@gov to check my status in september. checked ESC again and I had won. But the date in the letter is on may 3. 1. Is this normal ? 2. Entered dv as single.I had gotten married/registered marriage before 1NL.Traveled to US (included my spouse info on my ds 160). All before 1NL. Do they check ds 160 info as well? 3. Didnt receive 2nl yet. at NVC, do u think we have a chance before end of september? 4.Spouce got a scholarship to study abroad.It is very prestigious. Program starts in september. Do we have to cancel the scholarship? *Thank you for your help. Got so much info from ur page. 2. They might check the 160, yes. 4. No – you simply have to make a plan to activate the Green Card once approved and then either maintain the status by visits to the USA OR apply for a re-entry permit (allows a 2 year absence). Thanx. This site is by far the best site for DV information. Two thumbs up. I observe that visa bulletin for April cut-offfor Asia was 5500. And for May is current. To my knowledge number of selectees for Asia is around 12000. My question is: do they are going to process all remaining number in May an June as both show current? How can do theymake faster in these two months comparing to previous months processings? Since Nepal is limited, the number of cases per 1000 cases is very low. Iranians are current – but they don’t have high case numbers. Interviews could continue until September. 1.I submitted my DS260 in last week of May 2017. my CN is 2018AF11xxx you think that it a safe? 2.in which month should I expect an interview because I am expecting at least a six month research internship to India? 3. I mentioned on ds260 that I am a postgraduate student but yet not finished. does this matters? 4. is it necessary to authenticate all my academic credentials? 4. It depends on the instructions for your embassy. I got confused with visa bulletin. So I have some questions regarding it. 1. My son turns 21 this October. Case no. is 2018as12***. So according to this no. He will not get a visa as my derivative. My son aged out on next year may (I think). I saw visa bulletin is current for asia for may 2017. As like that for the next year asia is current in may 2018. Will my son able to get a visa? AS won’t be current in May. So, no – your son will age out. My wife is the principal applicant for DV 2017 with case number 2017AF42035. We submitted the DV-260 form on June 15, 2017. When will we be sited for interview ? We want to know as to whether our case number 2017AF42035 is current. is there any chance to interview ? is there something to do to increase the chance? or it’s just a matter of luck ? is that possible in the next month to see cutoff no of september changed? No, it is over. THe 36500 is the FINAL number. You can watch the bulletins, but all 2017 cases are scheduled. The dv2018 cases are nit current. Either way, you wait for the 2nl. How long does DS260 take to procces? Ps: Since they have changed the priorities in the DS260 so we can expect our ds260 earlier to be processed and even 2NL even if one submitted ds 260 like three months after 2 may? processing times vary case to case. So don’t “expect” anything. If you are current, Wait and see if you get scheduled. Hi Brit, We submitted in May when do we get our respond? According to the case number as described above. sorry i need know my interview expectation date according to your analysis my number is 13xxx . and the last question ( my photo and my family photo when i started to registration 2018 DV it was not qualified with their conditions ( is there any effectiveness at interview i mean they can refuse me for that reason . I don’t have an expectation date. I have no idea what you mean about the photo – but in any case, only the CO can judge. Currently iam living in Abu Dhabi, UAE. i filled out DVlottery 2019 in mailing address my current living address. Is it okay or i should have filled up my home country mailing address? Current address = CURRENT address. As I seen in past years VB, I’m in Sri Lanka and I had seen in last year VB put CURRENT for Asia number after 4700. So I applied 250 form in July 15th this year but my case number is AS85XX. This means I will not call for interview? It means you must wait and see. How do they actually contact you for your interview? My understanding to the post is that “current” means all the people would have the chance to have an interview, but does that mean everyone’s going to have the visa for sure? No. Each case is reviewed and people interviewed to make sure they meet the requirements. 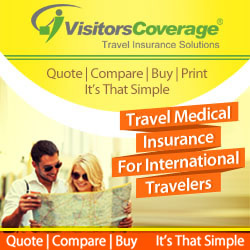 Also – a region will NOT go current if there are not enough visas for all. In that case there will be a cutoff in place – and that is the most likely scenario this year. Thanks for the reply Sir! There’s just one more question from me. According to the prediction of the cutoff number for Asia last year, it says current all the way after April. Is the prediction of current based on the total number of visa issues per year, or it’s according to the visa issues per month if there’s such a case? The prediction of current wasn’t a prediction at all – that was the actual VB. KCC announcing current means they believe they have enough visas to meet all remaining demand. I am a dv 2018 winner but my Grand father name differ in only one letter spelling on my degree certificate, does that matter to qualified for my visa?